Experience a whole new way to manage your practice with MEDITECH Expanse. With MEDITECH, your practice can leverage data from across your care network. That’s because our solution is fully integrated with other components of your MEDITECH EHR, creating a true single record solution. One patient record across the entire continuum of care, simultaneously enhancing safety, efficiency, and quality of care—all while maintaining your own workflows, practice styles, and even financial data. It’s the power of Expanse with the flexibility your practice needs. 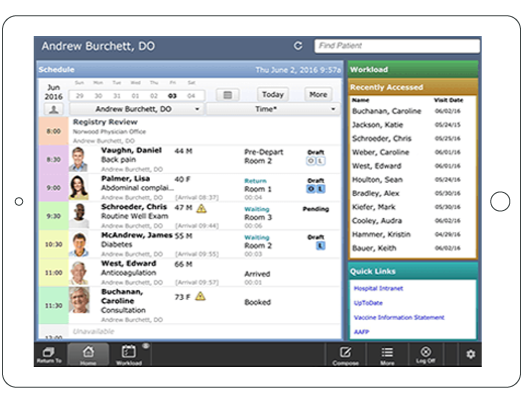 Set your physicians free with our all new touch-based interface, designed by and for physicians to run on tablets—and watch their efficiency soar with a shared toolset for Physician Documentation between acute and ambulatory environments. Use your favorite device and web browser to manage schedules, document visits, review results, prescribe, order, e-Sign, and much more. And leverage any combination of voice recognition, macros, dictation, and specialty-specific templates to document patient visits your way. With MEDITECH’s anytime, anywhere web-based access, your providers and staff will experience new levels of efficiency and productivity. MEDITECH's actionable Patient Registries update in real time, with information from across the continuum. Use it to manage patients with chronic diseases in lower cost settings, reducing inpatient and Emergency Department visits. Identify and monitor at-risk patients in danger of developing chronic conditions, such as rising HbA1c’s, high BMI’s, or high blood pressure. Promote wellness in your community by advertising upcoming flu clinics or smoking cessation programs. Follow up and monitor patients with recent Emergency Department visits or hospitalizations to reduce avoidable readmissions. Do all this and more with our intuitive web-based design that allows you to easily sort and filter your lists on-the-fly, or save and route them for later. MEDITECH Expanse helps you stay in sync with every member of your team—including your patients. Respond promptly to phone calls, route diagnostic results, process prescription refill requests, prioritize and direct tasks, and much more. Make scheduling conflicts a thing of the past with real-time, enterprise-wide conflict checking. Dramatically reduce missed and cancelled appointments with smart waitlisting functionality, and book appointments for your own facility or for any location across your care network from a single, intuitive scheduling application. Quality care starts with a strong foundation of expert-based content, developed by our team of practicing clinicians. Our Ambulatory solution is delivered with 260+ order sets, 590+ documentation templates, 65+ flow sheets, and over 100 general and specialty-based widgets representing over 40 specialties. We also provide a growing library of patient registries covering both chronic conditions like diabetes and congestive heart failure as well as patient events, such as hospital discharges and ED visits. This content helps standardize best practices throughout your organization, while also providing you with the flexibility to expand and refine content to meet the unique needs of your practices and clinics. Leverage our standard reports and tight integration with Data Repository to experience the power of reporting without boundaries. Zoom in and out on clinical and financial data from within your practice, across practices, acute settings, and beyond. Generate powerful standard and ad hoc reports—including AR, reimbursement, and month-end reports, as well as operational and executive summaries. Keep your finger on the pulse of your practice with intuitive, customizable dashboards to demonstrate you’re delivering efficient, high-quality care. And, stay ahead of the curve with Meaningful Use, P4P, ACOs, PCMH and other state and federal initiatives. MEDITECH Expanse is the tool physicians have been waiting for. Learn more about why MEDITECH's Ambulatory is just what the doctor ordered. Want a closer look at MEDITECH Ambulatory?